Introduction to Infrastructure: An Introduction to Civil and Environmental Engineering breaks new ground in preparing civil and environmental engineers to meet the challenges of the 21st century. 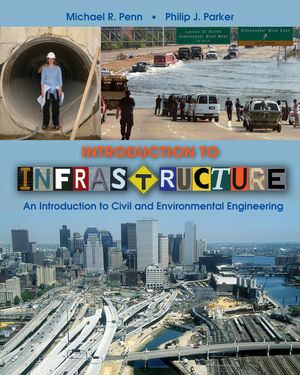 The authors use the infrastructure that is all around us to introduce students to civil and environmental engineering, demonstrating how all the parts of civil and environmental engineering are interrelated to help students see the "big picture" in the first or second year of the curriculum. Students learn not only the what of the infrastructure, but also the how and the why of the infrastructure. Readers learn the infrastructure is a system of interrelated physical components, and how those components affect, and are affected by, society, politics, economics, and the environment. Studying infrastructure allows educators and students to develop a valuable link between fundamental knowledge and the ability to apply that knowledge, so students may translate their knowledge to new contexts. The authors' implementation of modern learning pedagogy (learning objectives, concrete examples and cases, and hundreds of photos and illustrations), and chapters that map well to the ABET accreditation requirements AND the ASCE Civil Engineering Body of Knowledge 2nd edition (with recommendations for using this text in a 1, 2, or 3 hour course) make this text a key part of any civil and/or environmental engineering curriculum. Michael R. Penn is an Associate Professor in the Department of Civil and Environmental Engineering at the University of Wisconsin-Platteville and a member of the Water Science Team at the UWP Pioneer Farm. He specializes in surface water quality and nonpoint source pollution, involving undergraduate students in applied research projects. Areas of interest include fate and transport of nutrients and sediment, especially in snowmelt runoff. Phillip Parker is Professor Emeritus?of engineering at the University of New Brunswick in?Canada. Introductory case studies-Most of the chapters open with a brief Introduction, followed by an introductory case study. These case studies are revisited throughout the chapter in order to emphasize the learning objectives. Sidebars-Material is placed in the margins to enrich the content. Sidebars contain examples, definitions, ‘‘factoids,'' and synopses of current events. Cases in point-Case studies, in addition to each chapter's introductory case study, are included throughout the textbook. Conversational style-Throughout the text, the authors speak directly to the reader in a conversational style, to make the material more accessible. Outro-An ‘‘outro'' is the concluding section of a piece of music, and each chapter of this text concludes with an outro. It summarizes the chapter and introduces readers to the next chapter or to the remainder of the textbook. Extensive graphics-This textbook includes more than 400 graphs, schematics, and photographs. The authors purposely included photographs of some very commonplace components of our infrastructure, as experience has shown that many first- and second-year students are unaware of the purpose of these components. Analysis and design applications-Four chapters are included that describe examples of how civil and environmental engineers analyze and design infrastructure components. Two of these chapters are presented at the introductory level midway through the textbook and two at a slightly more advanced level at the end of the textbook. These chapters are more calculation-intensive than the other chapters of the textbook. Incorporates modern learning pedagogy -- Learning Objectives at start of each chapter, Cases, concrete examples , strong visuals (800 photos and illustrations), and multiple problem/question types at end of each chapter (Calculation; Short Answer; Discussion/Open Ended; Research) help develop deeper levels of learning.